Well supervised young shooters are always welcome at Bass River Rod & Gun Club! 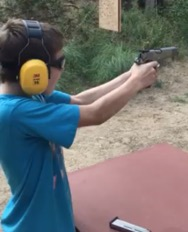 Click HERE to see Master David Kent enjoying a day at the range! Click HERE to see David’s safe gun handling skills - - wait until the end of the clip as he clears and tables his gun.